How SharePoint List Items are retrieved? How does CAML query looks like? As I already mentioned, it is XML based query language and it contains tags in it. The root element of the CAML query root element is Query. But it is not necessary to use Query element in the query you form. From the above structure, we came to know that it uses Where and OrderBy elements to retrieve the data from the list. OrderBy – Which orders or sort the data depends upon the field (FieldRef element) given. GroupBy – Which groups the data depends upon the group by field (FieldRef element) given. A caml query is build in two parts. Find out the operators such as =, <=, <,> etc. 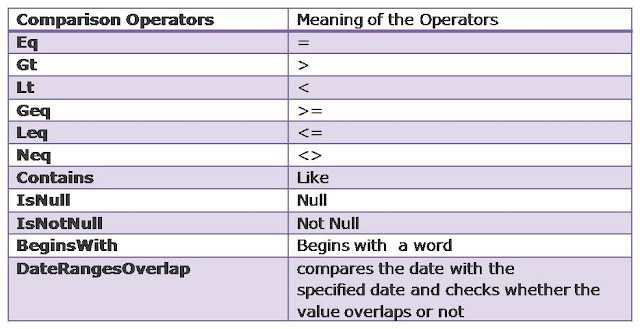 Find out the keywords for these operators in CAML language. For example = is eq, < is lt and so on. Break the sql string such that the operator comes first and then comes the operands. Continue this till the whole string is completed in this fashion. Replace the operators with the keywords in CAML language.